This may sound cheesy, but Valentine’s Day has always been my favorite holiday. Even when I was single, I love everything about the idea of a holiday that celebrates love! Even when I was a little girl I remember having so much fun making little paper Valentine’s for all of my classmates. I love the decorations, I love seeing huge bouquets of roses everywhere, I love the little teddy bears hanging on to everything. I just love it! Lucky for me, I have eight amazing friends that love it as well – that is why we all teamed up to do a super fun Valentine’s Day Event for all of our amazing readers. 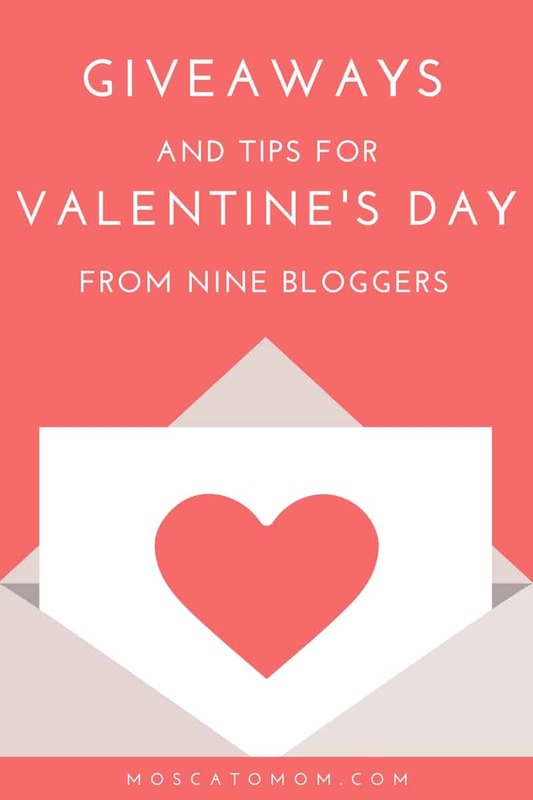 I, along with eight other bloggers, are each running great giveaways individually to help you have an amazing Valentine’s Day. Each one of the links below has a great tip and a giveaway that you can enter! How cool is that!? You can scroll down to see my tip and giveaway, and then hop over to these ladies and enter theirs too! Each giveaway is completely separate – that means you could even win all nine! Ok so let’s be real for a moment… there is a lot of pressure put on Valentine’s Day that really is unnecessary! Why stress over something as natural as love?! Whether this is your first Valentine’s Day together or one of many – or even if you are gonna rock this holiday single with your besties – Valentine’s Day can be amazing with just a few little tips. 1 – Don’t overthink it. What does he/she mean to you? What are his/her favorite things? This isn’t a contest. You aren’t being graded here. Think back – where was your first date? First kiss? Or what is his/her favorite dessert? Favorite hobby? Have you ever written a love note? A heartfelt gift with sentimental meaning of some sort goes way further than simply spending a bunch of money. 2 – Don’t wait until the last minute. For the love guys… here is your warning. You have THREE WEEKS until the big day. Do not go walking into the store on February 14th and be made when everything looks picked through. The stores have had Valentine’s stuff out since before Christmas… I know you have seen it! Get it while the good looking stuff is still there. Even if you are simply writing a letter to tell your person how much they mean, do not wait three weeks to get started. If your person finds it early – it will be a great surprise and they will love that you were already thinking about Valentine’s Day! Trust me – you will win either way. 3 – Remember that the point is LOVE. That’s it. I can not think of one thing that we need more of in our lives than love. (ehh… maybe money, but I still think love wins) So make sure you lead with that. Relationships are tough, and we do not always take the time to tell our people just how much we care. And that goes beyond just your primary relationships to include your family and your friends. If your “heart” is in the right place (pun intended) Valentine’s Day can be a wonderful holiday for everyone. Oh my family loves this place!! Would love to win this! My husband has to work Valentine’s night but we could go another evening! Have never tried Cheddars… would love to! Thank you for all that you do and I love reading all of your posts! I have never eaten here but have been dying to try it!